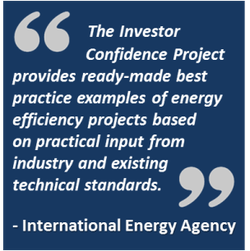 The Investor Confidence Project Europe unlocks access to financing for the building, industry, district energy and street lighting markets by standardizing how energy efficiency projects are developed, documented and measured. By streamlining transactions and increasing the reliability of projected energy savings, ICP Europe intends to build a marketplace for standardized energy efficiency projects. Individual projects can then be aggregated and traded by institutional investors on secondary markets – just like mortgages or other asset-backed securities. The Investor Confidence Project is driven by the needs of an evolving industry. We are constantly looking for feedback on our protocols and input through our Technical Forums, and encourage interested stakeholders to participate in the process by joining the ICP Europe Ally Network. 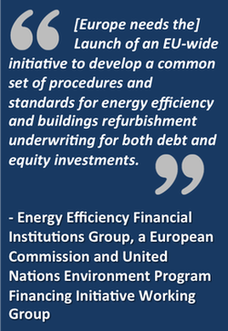 Help ICP unlock the potential of energy efficiency as a global asset class.